Mohammed Abu Rajab’s life was never what one might call “average,” but at least he used to be able to use his front door. Mohammed, 27, grew up in the Hebron’s Old City, surrounded by illegal Israeli settlers. Settlers taking over homes in Hebron is not uncommon, so it came to no surprise to the family when they were delivered a notice in 2012 informing them their family home had been sold to settlers, and they would have to leave. The Abu Rajab’s took the notice to the Civil Administration, the Israeli body in charge of the occupied West Bank, claiming that the home sale was a forgery. Settlers said they had bought the home from a member of the Abu Rajab family, but Mohammed and his parents were able to prove that the family member the settlers claimed they bought the house from had no ownership rights to the property. The Civil Administration sided with the Abu Rajabs, stating that the sale was invalid, but the decision was challenged by an appeals committee and the case is currently being reexamined. No decision has been made in the appeal, but the Israeli settler family decided not to wait, and forcibly took over the vacant upper floors of the home on July 25. Far-right Israeli politicians have been vocally supportive of the settler’s takeover of the home, calling for the Israeli family to be allowed to stay. The Abu Rajab family hopes a petition they made to the Israeli Supreme Court will help them reclaim their home. According to Haaretz, an Israeli Supreme Court Justice ordered that the Israeli state respond to the petition made by the family by August 16, but it is unclear whether authorities will comply with the order. For now the settlers are under protection from Israeli forces, who are enforcing the ban on Mohammed from using his front door to go home, which they say is a security precaution, even as the settler’s stay in the home is against Israeli law. “They denied me access from entering my home from the front entrance, and they put barricades in front of the house,” Mohammed explained as he led Mondoweiss through the path he now takes to get inside his home. Mohammed led us through his parents front door, out their back door, through the backyard and around to the side of the building where there is an alternative entrance to his house. The settlers that now live above him throw trash down from their window down onto the garden path his takes home. Diapers, bottles and food waste littered the way. The side entrance where Mohammed now uses to enter his home sits right under an open drain where dirty water is pushed through every few days. Mohammed bought piping to extend on the drain in order for the water to be released away from his entrance, but the settlers refused to allow him to install it. During Mondoweiss’s visit, a bus full of Israelis arrived at the home and started celebrating in the street in front of the house, under protection of Israeli soldiers. “They are celebrating, you can see how they are inciting against the Palestinian people and against myself and my family,” he said, watching the celebration through a window. Mohammed said similar events have been happening frequently ever since the home was taken over, if any of the Palestinian residents react to the display, Israeli soldiers forcibly remove them. Peace Now, an Israeli anti-Settlement group strongly condemned the settler takeover of the home. “Thus far, the settlers were unable to prove ownership, and the Palestinians argue that a purchase has not been made. Moreover, the settlers are claiming only partial ownership of the property. Furthermore, even if eventually the settlers will prove their ownership, this does not represent sufficient cause for the establishment of a new settlement in the heart of the Palestinian city of Hebron,” the statement explained. The group demanded “the government orders the immediate evacuation of the settlers” who “invaded” the home. … The settlers that now live above him throw trash down from their window down onto the garden path his takes home. Diapers, bottles and food waste littered the way. Zionist Jews willingly do evil. The Zionist “Jewish State” empowers and protects them. Fellow Zionist Jews defend them. Together they cry “anti-Semitism!” if anyone rightly objects. So they behave like uncivilized pigs. And this is a “nation” that calls itself a democracy. What word did Annie use before?? A democapartheid?? And what should be explained/made very clear to them is, that the Palestinians are humans and that way neighbors too. No room for opposing there. What really bothers me is, that these settlers are like spoiled brats to whom their parents did not teach any manners or boundaries. They are spitting on people, throwing garbage and jumping on tables like animals.. And who let this happen?? Without the protection of IDF this would not be possible. So simple, but still, why can it not be stopped?? And this is the exact thing that makes me so sick, it has made me difficult to keep any of my good memories from Israel. These settler actions make all the Israelis look like psychopaths who smilingly show around in their big, fancy homes with a beautiful view from the balcony, while at the same time they are holding abused and beaten people tide as prisoners down in their basements. And everyhting is ok as long as you do not accidentally lose your way to the cellar while trying to find the bathroom. And then, when you finally do, and the dirty secret is revealed, what is there left to remeber? The helpless prisoners whom you could not set free.. And the beautiful view from the balcony, makes it even more disgusting. Well said. I was thinking along exactly the same lines, and also this: the same “settlers” have also invaded Mondoweiss and keep throwing virtual banana peels, rotten veggies, sewer material and the kitchen sink, relentlessly, in a more or less successful attempt not to let others turn their attention to discussing what they can or should do. Make no mistake, it’s all the same “settlers”, no matter if they call themselves liberal or cavemen. It may be forbidden to covet one’s neighbour’s goods but it is permitted to take what God gives you not because you covet it but because he has a higher purpose which we cannot expect to understand in full. To be God is to have thoughts beyond human understanding and to have rights to override the normal moral rules – for the best in the end, of course. The idea of divine donation – the great intervention, the unique reshaping of history – is never more than a millimetre beneath the surface of Zionist claims despite the parade of atheist masks. The awful thing for me is that some of all that is true. Mixing beliefs and regional politics, just is not my thing. And for me the Holy Books are metaphorical narratives and that is why I refuse to read them literally and take them as piece of evidence on anything. “echin” give them a break! After all, most of what they say would not be suitable for an English-language Zionist site, so they come here to get their freedom-of-speech. This Palestinian’s home is a “divine donation” to the settlers? My He does work in strange ways His wonders to perform. People should be judged as individuals, not as members of a group. I leave it to you to determine which pedophiles are good pedophiles and to judge them as individual pedophiles rather than as members of a group of pedophiles. I’ll stick to judging all people who believe in, advocate and defend pedophilia as hateful and immoral people. It never ceases to amaze me how some will defend even pure evil incarnate, if for no other reason than tribalism. And what should be explained/made very clear to them is, that the Palestinians are humans and that way neighbors too. No can do (yes, that is peculiar English but still English.) 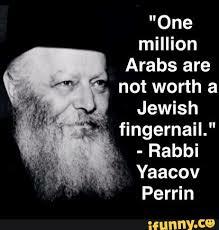 The Palestinians are not born Jewish. Think that even converts to Judaism do not really count as human. thank you for the sobering video. hebron’s settlers (not to mention their supporting army) put lie to the fable that israel is in a ‘tough neighborhood’, when they themselves make such terrible neighbors. By Lior Dattel. Aug 15, 2017, Haaretz. These settlers are a disgrace and shaming israel – which doesn’t seem to mind. The fanatical Jewish settlers in the old city of Hebron present a grotesque spectacle to the world. Too few Americans are even aware of the situation. Yes. However, many more are aware today than there were ten years ago and their numbers are increasing rapidly, especially among all important youth, including righteous Jews. I am definitely not righteous; on the contrary I am the poster child for sins – lust, sloth, greed, you name it. I don’t even believe in anything. It warms my heart to come to Mondo though and see people who just care. Who are generous, kind and most important moral. Because my own morality is pretty much selfishness. Yes, I care about you too. You know, a friend of mine died about a year ago, after fighting against cancer for several years. She was not ready to leave and did not want to go, but the cancer ate her, no matter which treatments were used. I wish you use your life wisely, cause you are still here. i’ve never been to al khalil but i have been to east jerusalem. i visited a family living in under a tarp on the street right below their home which had been taken over by settlers who had arrived from brooklyn just 2 days before. the settlers had israeli flags hanging all over the palestinian home they invaded and stole and the settler women were hanging laundry on the large flat roof of which served as a large outside deck. there were private militia-type guards with guns above the house and the settler men were walking in and out as if they owned the place. the palestinian family were sitting on couches under a large tarp. they served us tea. it was devastating. there were little jewish school children, boys in orthodox clothing, walking by and entering another building across the street. i will never forget being there or how i felt — like there was nothing i could do. Speaking of illegal squatters receiving assistance from the so called most moral army !!!. It turns out that the rogue nation has so far spent 180 million shekels relocating 40 families of illegal squatters from one illegal squat to another , each time on occupied Palestinian lands and now plans to spend an additional 70 million (total 1/4 billion , circa 60 million dollars = 1,5 million per family.) creating another illegal “Jewish Community” on occupied Palestinian land. All paid for by the Israeli populace and the American taxpayer. Get your barf bag out before reading this. Defendant to Judge in robbery case !!!. But your honour , I spent all the money I robbed but why would you cause me distress by forcing me to return it. .It,s all gone .That would be inhumane treatment . So what about the distress you caused your victim. But , your honour , I am simply asking for a humane, proportional and reasonable response to my genuine distress . This article speaks to the utter contempt Israel has for every word of international law set down on the subject of military occupation since the end of WWII and the shameful complicity of the US government, without whose aid and assistance such disgusting behavior would not long endure.